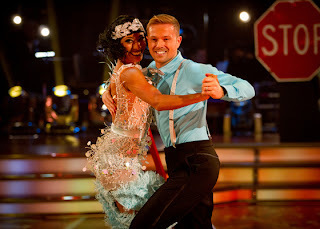 Frankie and Clover's Strictly Come Dancing Blog! : Non-Salsa of Doom! Brace yourselves viewing public, there's no Wembley, there's no theme, you might be getting a normal episode of SCD this week. Although, I'm not actually sure what normal means in this spangle-tastic world, Tess' dress is even quite nice this week! But don't worry, it still takes Bruce twice as long to get through the intro as he needs too, long(er) may he live! I'm distracted because Kimberley suddenly looks like Kylie, what's that about? Plus a seriously fierce Grace Jones facial expression, this girl means business! A proper tango, so sharp and staccato. Not much more to say, it was fab. They've chopped the arms off Sid's paso jacket, BBC cuts are really starting to bite. The sparkly Primark vest underneath kinda ruins the look though. Wasn't too sure about the song choice, it was a bit sparse and maybe that took away from the emotion. It was technically good, footwork and lines etc, but lacked that serial killer instinct that you need on a family entertainment show on a Saturday night. This song makes me cry. I have to pretend I have something in my eye. A genius song choice actually, it builds wonderfully and is so emotional, it's not like Lisa could do something fragile and willowy. It didn't suit her no, but she performed the steps as well as ever, her timing as brilliant and she maintained the syncopation with Robin. Keep on it Lisa! Natalie has stolen Aliona's dress and Zoe's fringe, is she going incognito this week? Has her super-spy cover been blown? This was not good for me, it was very placed and Michael's sticky-out bum was back. It was like they were two people doing different dances. I was expecting this to be delightfully insane, plus there was the additional fun of Karen's Minnie Mouse hair. And what fun it was! Really liked the routine, it was zany and bouncy all the way through with lots of energy. I was really surprised how many times Nicky threw her around actually! Could maybe have done with a tad more swivel, but I think he's close to winning most improved at the moment. Now, I don't not like Denise just for the sake of it. I've really enjoyed a lot of her dances. But this was ruined by the terrible song choice and pointless lift. Her arms are amazing by the way. Wow, Fantastic Blog,I Feel this is one of the most essential information for me. And i am very happy reading your article. Rumour has it...it was a good 'un,.